My husband and I, well ok, really just me, is always looking for the best ice cream joint I can find. But my husband does a lot of feed this love affair I have with ice cream. He’s constantly sending me articles he finds on the Internet which lists the best ice cream joints in the country or the world or stories about new ice cream parlors that are opening up, etc. One of these “best” lists had a very well known New York ice cream joint on its list. So for our trip to New York, I made sure to schedule in a detour to one of the ice cream joint’s locations so that my husband and I could sample for ourselves how good, or not, this ice cream really was. We even had to forego dessert at The Spotted Pig so that we’d be able to handle ice cream at this store shortly thereafter. Now you know how serious I am about my ice cream. 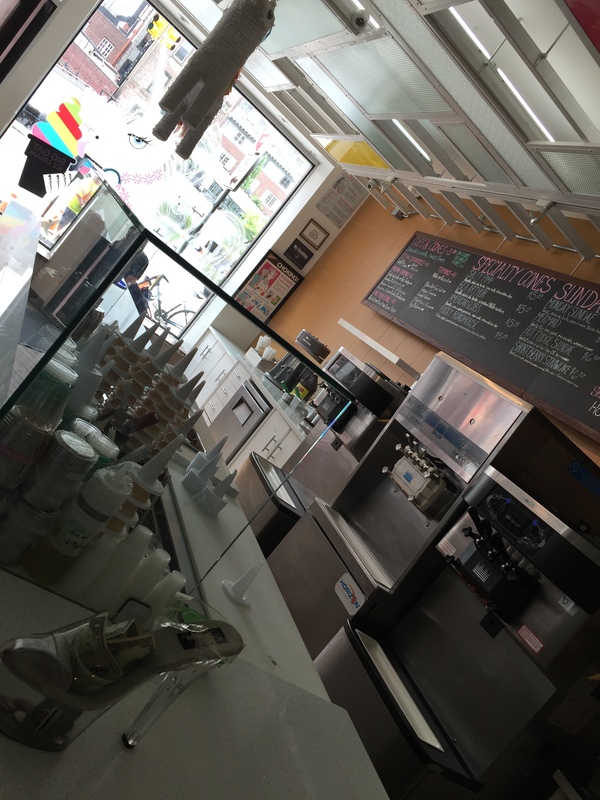 Big Gay Ice Cream is the brainchild of Douglas Quint and Bryan Petroff. Opened as an ice cream truck in Manhattan in June of 2009, they soon gained a huge following. 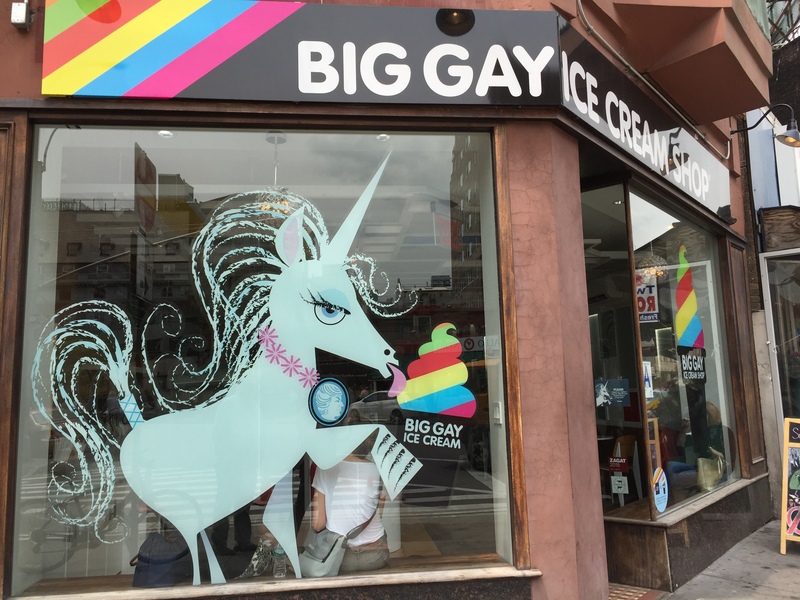 With its loud and proud name brand and its delicious ice cream creations, Big Gay Ice Cream open its first brick and mortar store in the fall of 2011 in Manhattan’s East Village. It was followed the following year by a location in the West Village. With its signature soft serve creations with outrageous names such as the Salty Pimp, they changed the way that the soft serve ice cream game was played. In 2013, in partnership with Ronnybrook Farm Dairy, Big Gay created its own proprietary soft serve ice cream. Today, with unique toppings and frozen treats, Big Gay Ice Cream changes the landscape on old-school soft serve ice cream. Stopping in at their West Village location, we were lucky to arrive early enough to beat the crowds. I’ve seen pictures of this particular location with lines out the door with throngs of people waiting to get their hands on a creative ice cream creation. In fact, later that night, when it was drizzling, we walked past this store again and it was already crowded and filled to capacity with people even in the dreary weather. While Big Gay is known for its creative sundae combinations, you can also just get straight up soft serve ice cream in a cone or a waffle cone. With the available soft serve flavors of chocolate, vanilla and twist, you could spice up your cup or cone with premium toppings such as dulce de leche, bourbon butterscotch, red chili pistachios, ginger syrup, grape saba, fig balsamic and key lime curd. You can also choose to have the inside of your cone or waffle cone lined with nutella, biscoff or peanut butter. Now that’s something I don’t see every day. However, it’s the specialty cones and sundaes that really draw people into Big Gay. With names such as the Salty Pimp, Bea Arthur, and Rocky Roadhouse, how can you resist? Their most well known creation is probably the Salty Pimp made with vanilla ice cream, dulce de leche, sea salt and dipped in chocolate, the name is almost as giggle-worthy as the cone is delicious if you like a little sweet and salty. American Globs is another salty and sweet combination that’s made with vanilla, extra dark pretzels, sea salt and dipped in chocolate. Or the Rocky Roadhouse with chocolate soft serve, toasted almonds, marshmallows and chocolate chips. As a sundae, you could get the Monday Sundae with twist ice cream, dulce de leche, whipped cream, and a Nutella-lined cone. 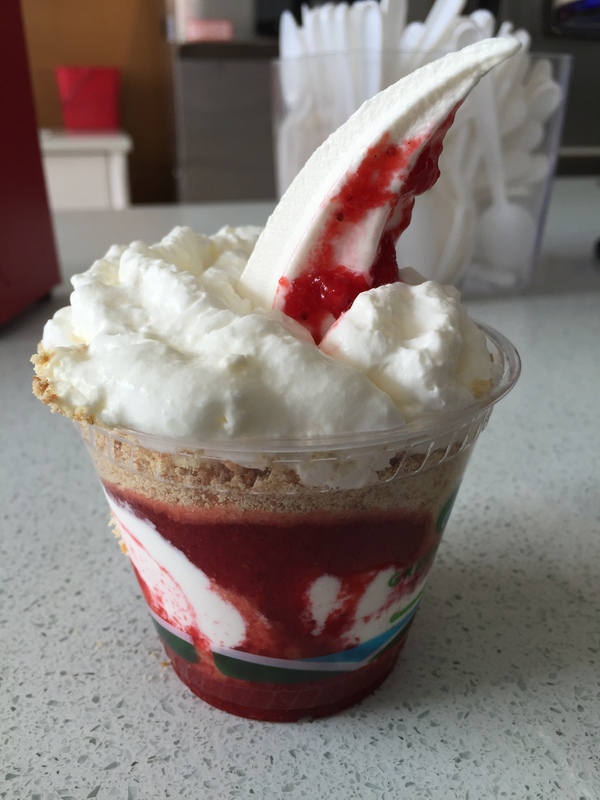 What about a sundae called the Mermaid? Made with vanilla ice cream, key lime curd, pie crumble and whipped cream, I thought for sure my husband was going to order a Mermaid. After looking over the choices, my husband decided to order the Bea Arthur in a waffle cone. Usually made with a regular sugar cone, the waffle cone is an upgrade and gives you a bit more ice cream. 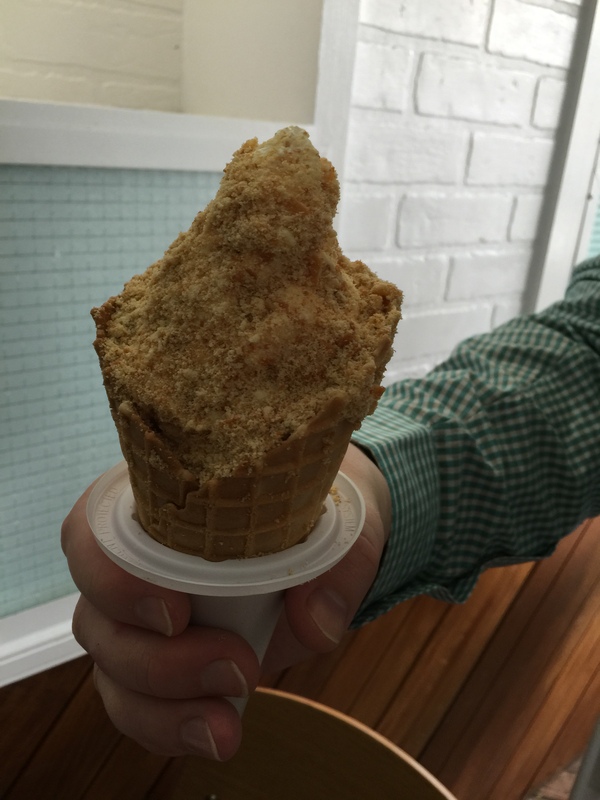 The Bea Arthur is made with dulce de leche and crushed Nilla wafers lining the inside of the cone. My husband was super excited when he saw the dulce de leche being spread through the inside the waffle cone and then spoonfuls of crushed Nilla wafers being added to stick to the duce de leche. Then vanilla soft serve ice cream fills the entire cone before more dulce de leche and crushed Nilla wafer cookies coat the entire exterior of the vanilla ice cream. You even get a handy dandy waffle cone holder with your waffle cone creation. My husband liked his Bea Arthur. He’s already a fan of Nilla wafers and likes the flavor of them, having the inside and outside of the cone lined with crushed Nilla wafers was terrific. He liked the combination of the Nilla wafers with the ice cream as it gave a great crunch to the creation. Then add in the sweetness of the dulce de leche and it all worked for him. The one thing that my husband was disappointed with was the fact that we weren’t aware that Big Gay Ice Cream is known for their creations made with soft serve ice cream. Generally, all the other ice cream places we’ve been to, they make their own unique ice cream flavors and then make crazy concoctions with those unique ice cream flavors that they’ve created. 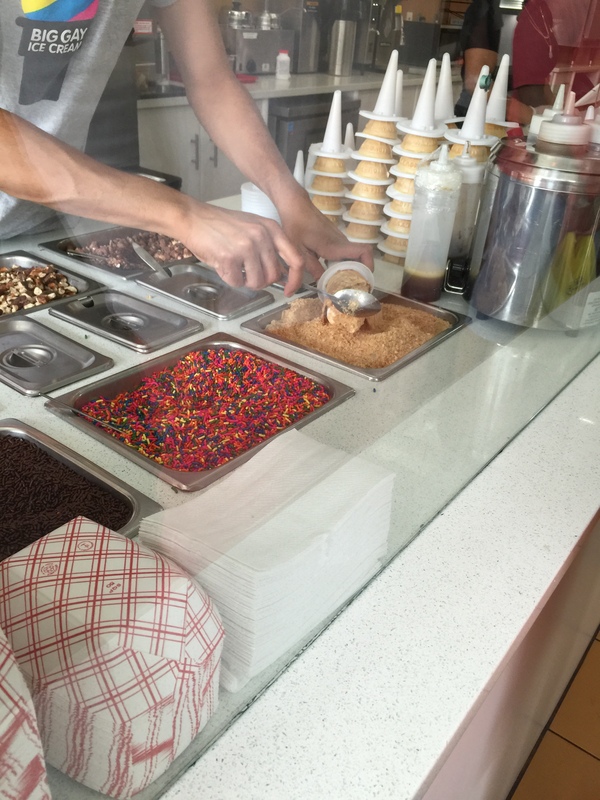 Here at Big Gay, they take soft serve ice cream, and while it may be their own proprietary brand, it’s still soft serve ice cream, and they create something unique with it by adding toppings and flavorings. We weren’t expecting that, and it was a bit of a disappointment to us that we were starting with vanilla and/or chocolate soft serve ice cream. For my selection, I chose the shortberry strawcake sundae. In a cup, you start with strawberry sauce and crushed Nilla wafers. To it, you fill the cup with vanilla soft serve ice cream. Add more crushed Nilla wafers and strawberry sauce, and top the whole thing with Ronnybrook whipped cream. Having that little bit of soft serve ice cream stick out of my sundae is kind of a signature look of Big Gay’s. The shortberry strawcake was tasty and fantastic. The strawberry sauce was terrific and filled with lots of chunky strawberry and not too much sweetness. Like my husband, I thought that the crushed Nilla wafers really made the difference in my dessert. They added a little hint of sweetness to the dessert, but added a great deal of crunch and textural feel to the soft serve ice cream. The whipped cream was very lightly sweetened, which was perfect. It added creaminess as you’d expect in a strawberry shortcake, but without adding the sweetness because there’s already enough sweet in the strawberry sauce and the ice cream, and to some extent the Nilla wafers. I’m a big fan of strawberry shortcakes, and this shortberry strawcake is a great representation of the dessert in ice cream form. I’d order this again at Big Gay Ice Cream. Now, another ice cream shop to cross of my list of ice cream places I have to try. We skipped dessert at a Michelin-starred restaurant to give Big Gay Ice Cream a try. Both my husband and I enjoyed the ice cream creations we ordered. The Bea Arther and the shortberry strawcake were full of flavor and texture and were both delicious. While we both were a little disappointed in the soft serve ice cream aspect of this ice cream shop, the creations they made were unique enough that we couldn’t help but enjoy it. After all, it is ice cream, and ice cream is never a bad thing. While I’m not sure that this classifies as one of the best ice cream shops I’ve ever been to, and I think that accolades it receives may be a bit over-the-top, nonetheless, I would visit Big Gay Ice Cream again.